Illustrations completed by Potter? Check. Lyrical writing describing the world Potter grew up and gardened in? CHECK. Best known for writing about Peter Rabbit and Mr. McGregor, Potter's influence can be found in children's literature. But learning who the person was - and what was happening in her life that influenced her stories - is how Marta McDowell makes Potter come alive. Potter was surrounded by nature at Hill Top Farm, her primary gardening space, although she acquired many parcels of land in England during her lifetime to prevent it from being developed. In fact, it was her love of gardening and the desire to accumulate more land and plants that encouraged Potter to keep writing. The royalties she made on the books went back into her gardens. I was familiar with Potter's children's stories while growing up, and was able to reread them and follow their progression as McDowell shared Potter's life story. But the best part of all - and the one that made me buy this book - was learning about Potter as a gardener. McDowell shared how the flowers Potter chose to illustrate her scenes with her characters - whether it be Jemima Puddle Duck surrounded by foxgloves or Timmy Willie walking among the pinks and pansies - were specifically chosen because they were grown by Potter herself. Correspondence to her friends about her garden were also interesting to read. Potter grew up as an animal lover, and McDowell weaves Potter's love of animals and her developmental journey as a gardener together. I found myself enjoying McDowell's prose immensely and started using sticky notes to bookmark the paragraphs I liked the best. For example, when Potter purchased Hill Top: "Gardening can be described as a hole one digs in the ground into which to shovel funds. There is always a new project, a new plant, or a new tool." (p. 105-106.) Or reading how Potter was "infected with the gardener's imperialistic tendency. There was never enough space for all of the plants that one lusts after or the design ideas that come to mind." (p. 111). When describing how Potter would gather seeds from her gardens and the woods, McDowell writes "Seeds are tiny bundles of next year's garden, there for the asking. They are like magic, like the fern seeds that cloaked "The Fairy Caravan" with invisibility." (p. 247-248.) The ending is noteworthy, too, but you'll have to read that for yourself. 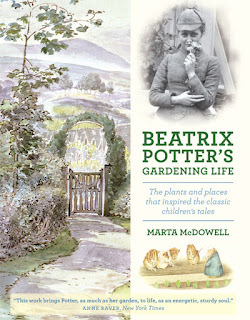 The book is divided into three parts: Potter's life as a gardener, a year in her gardens and visiting the gardens today. In the appendix McDowell also includes an extensive list of the plants Potter grew in her gardens, which acts as a "bonus track" for the gardeners among her audience. Beatrix Potter's Gardening Life retails for $24.95 and is published by Timber Press.